If I could only eat one type of sweet treat for the rest of my life it would be a toss up between chocolate and caramel, but in the end the ooey gooey caramel would be victorious. 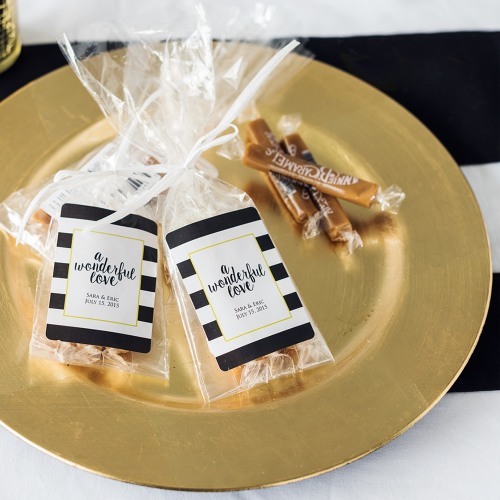 Which might be why these personalized bags of handmade caramel sticks are my new favorite edible wedding favor. Each bag of candy features three handmade caramels in a clear cello gift bag that can be personalized to fit your theme and style. The label choices for the gift bags are hip and modern and fun and your guests are going to love these sweet treats. These would be the perfect favor at a reception candy bar and they would also look great at each place setting. You can never go wrong with edible wedding favors! You can find these personalized bags of caramel here.